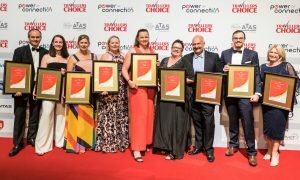 Thirty high-flying Travellers Choice members will be exploring the Orient, cruising down the Rhine or embarking on an experiential journey through the heart of Australia in 2019 after being named as winners in the national retail travel group’s celebrated Choice Awards program. This year’s 10 Gold Choice Award winners will set sail in April 2019 on a luxury Azamara Club Cruise from Hong Kong to Japan. The elegant eight-night voyage onboard the line’s boutique-sized ship takes in Taipei, Kagoshima, Osaka and Kyoto, where the agents will visit the Temple of the Peaceful Dragon and the Nijo-Jo samurai castle. Each year Travellers Choice presents its top 30 performing agencies with Gold, Silver or Bronze Choice Awards, with winners determined by the level of support they provide the network’s stable of preferred suppliers. As well as winning spots on dedicated educational trips, recipients take part in exclusive sales incentives and receive service grants worth up to $1500 per agency, which they can use towards member services, including the network’s email marketing platform, website solution and new Itinerary Builder solution. The 2018 Silver Choice Award winners will also be cruising in April when they embark on an eight-night voyage along the Rhine as guests of APT. Travelling from Basel in Switzerland, the 10 agents will pass through the Black Forest region, walk the cobbled streets of Cochem and dine at medieval Namedy Castle on their way to Amsterdam. Meanwhile this year’s Bronze Choice Award winners can look forward to a coast-to-coast adventure with Journey Beyond – one of Australia’s leading experiential tour operators. The journey will travel from the white sands of Rottnest Island to the hazy vistas of the Blue Mountains, along the way enjoying three nights’ on the Indian Pacific and some memorable off-train excursions. Speaking at Travellers Choice’s Annual Shareholders’ Conference, held over the weekend at the Cairns Convention Centre, Managing Director Christian Hunter told delegates this year’s winners fully deserved their rewards, however, the benefits of the Choice Awards ultimately flowed to all of the group’s member shareholders.